Saturdays and Sundays this time of year will bring neighbors together for brandings. Everybody does things a little differently, but the one thing you'll find at nearly every branding is a cooler full of expensive, essential vaccines. 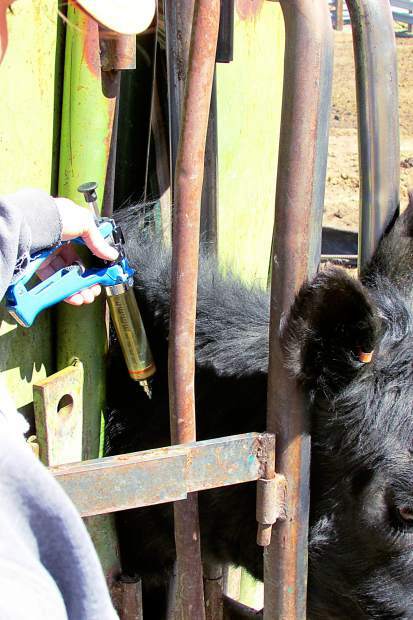 Vaccines have been shown to save countless hours and dollars for cattle producers, however, safe practices and awareness aren't always the highest priority. "Watch your surroundings when injecting and keep it as safe as possible. 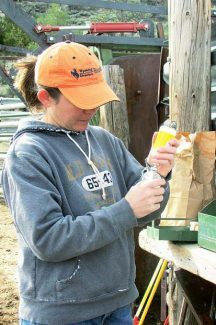 Prevention is key," said Hallie Noland, co-owner and veterinarian at Sage Veterinary Services, in Baggs, Wyo. "You're working with live animals. Precaution should always be used when handling any medications that can cause severe health issues. 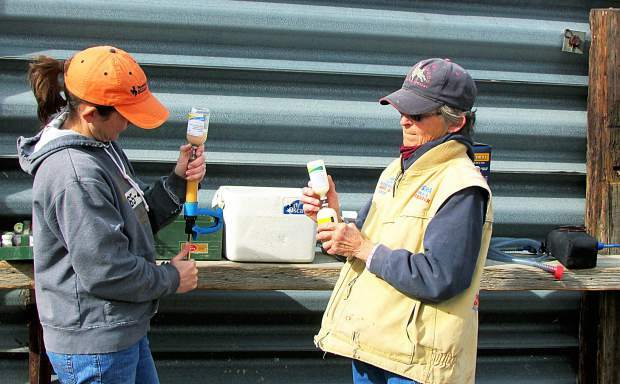 Never handle the needle itself, always change the needles often and always have a sharps container for the used needles," said Lisa Dixon, of Dixon Cattle Company, a company that has been around for more than 30 years that had a custom processing crew in Kansas that tested the Synovex and Revelor guns and many drugs. 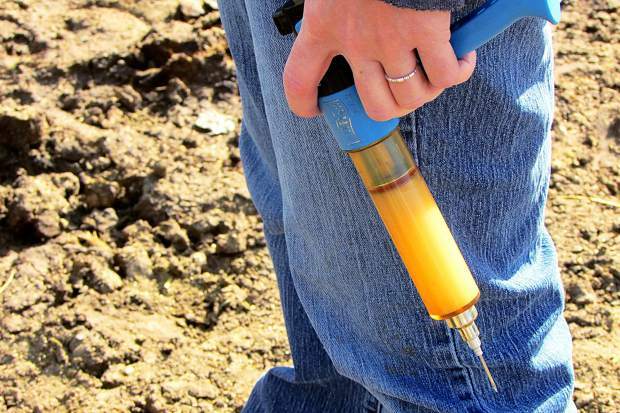 Micotil is an antibiotic used for the treatment of bovine respiratory disease. Noland's husband and co-owner of Sage Veterinary Services, Ben Noland, said, "Needle sticks can cause bacterial infections and cellulitis, and from a dirty needle, tetanus is a concern. Micotil is very deadly; a person will have heart problems if injected." "Other vaccines will hurt like the dickens," Hallie Noland said, "LA200 and Biomycin are two of them. Bangs, which is a modified live vaccine, can cause a person to get brucella. The blanket thing is to avoid being stuck, or, if you do, call quality control." Women of child-bearing years need to be even more cautious if handling animal medicines. "For women, Regu-Mate can cause reproductive problems," Hallie Noland said. "Lutalyse, Estrumate and prostoglandins cause women to abort if pregnant. Regu-Mate can cause women to lactate; oxytocin, as well, as it's used for milk letdown and contractions." "We never allowed women who can still have children to use these products, period," Dixon said. "Pregnant women or those of childbearing age should not use any prostaglandin-based reproductive products. If pregnant women do use them, they should wear gloves and should be careful." Minor needle sticks do occur and unless there is a reaction, no further action is needed, sources said. "Vaccinations are similar to what is given to humans, unless you have a reaction or are allergic to medications, a doctor shouldn't be necessary," Dixon said. "Safety should always be practiced, and people who are allergic should be careful. In all the years we've worked cattle, we've had minimal incidents." "You definitely want to make sure if you just poke yourself to wash it with soap and water and make sure you're up to date on tetanus, then you can wait and see how it does before seeking medical treatment," Ben Noland said. "If you inject something into yourself, you want to consider going to doctor; you probably don't need an ambulance ride. Being up to date on tetanus is pretty important and watch for bacterial infection at the site of the needle stick." Michelle Duncan, a rancher and EMT in Dixon, Wyo., said she prefers to check an accidental needle stick than deal with it after it has turned into something more severe. "There are times when people have said, 'I just wanted to finish the day out' or 'I thought the pain would go away'. That's not a good plan," she said. "Most of the members of our service get phone calls from the neighbor asking for a quick check that ends up in a trip to the emergency department. We absolutely don't mind those checks and would prefer that to hearing bad news later. People can die from a injury that they think is minor; that poke from a needle can turn into blood poisoning." Never give yourself animal medicines, Ben Noland said. The doses are not designed for human use, even if weights when dosing are the same. "I would advise not to give yourself animal products; they are not tested on humans for safety and could be harmful or fatal," Ben Noland said. "Animal antibiotics are made for animals, and they are not diluted finely enough like human antibiotics are," Dixon said. "Using animal antibiotics on humans, if given a certain amount, would cause extreme muscle inflammation and irritation." Even when using extreme care, accidents can occur when using medicines. "My recommendation to everyone is to read labels and educate themselves. I'll admit to stepping off a horse with the syringe of Micotil," Duncan said. 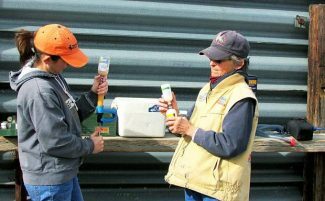 "Despite having a severe allergy to penicillin and sulfa, I use it quite often, but I also always carry an Epi-Pen." "I've had a couple of incidents where I've accidentally dropped the gun and tried to catch it and poked myself. The injury is the same as getting poked by a needle when sewing. I did not get any medication in me, and there was no swelling," Dixon said. Operating a gun or syringe in a particular manner can minimize the chance of accident injection. "Practice one-handed injection techniques," Ben Noland said. "Many people pinch with one hand and inject with another; don't do that. Using proper animal restraint is important. That's where a lot of those sticks happen, when a calf is kicking and jumping around." Most ranches are not conveniently located several minutes from a hospital; be mindful when working with animals and medicines. "Always practice safety techniques and don't hurry," Dixon said. "Remember, you are working with live animals. If the person has never worked cattle and does not know the drugs being used or how to administer the drug, they need to hire professionals. We are an experienced, trained crew."